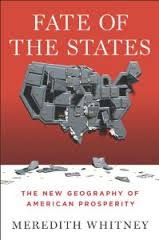 I'm reading an excellent book during this holiday week called "Fate Of The States: The New Geography Of American Prosperity" by Meredith Whitney. The book focuses on the coming trouble in the municipal debt markets for many cities and states throughout the United States. The first half of the book goes in depth on both why the crisis is coming and where it will be located. The chapter on pensions is incredible and opened my eyes to how difficult it will be for many areas of the country to dig out from these monstrous unfunded liabilities. The second half of the book focuses on a more positive outlook, which is the growth of states that did not over leverage during the boom years and how they now have the ability to provide low taxes, healthy businesses environments, and infrastructure growth over the next 10 years. Meredith sees a movement toward the central states in the country where states will experience a prosperity boom combined with economic growth similar to a developed nation outside the United States. This will only be fueled more by their ability to produce energy and agriculture. For anyone interested in how the United States will be re-shaped in the decade ahead, or anyone considering making an investment that is dependent on their local economy (purchasing a home, an investment property, or opening a business), I would highly recommend reading this book before doing so. The coming changes will impact the quality of education for children in local markets and for some of the most troubled markets it will impact how safe you will be living there. The following is an interview Meredith recently gave with Steve Forbes discussing some of the topics found within the book.